Certain modern scholars, notably Buddhologist Edward Conze (1966) and, following Conze, Elaine Pagels (1979), have proposed that similarities existed between Buddhism and Gnosticism, a term deriving from the name "Gnostics" given to a number of Christian sects. An early suggestion of the connection of gnostic-theosophic teachings with Buddhism was the Saint Petersburg Tibetologist and Mongologist Isaac Jacob Schmidt's pamphlet „Über die Verwandtschaft der gnostisch-theosophischen Lehren mit den Religionssystemen des Orients, vorzüglich dem Buddhaismus" (Leipzig 1828) ("About the relationship of Gnostic theosophical teachings with religious systems of the East , especially Buddhism") . This was developed by Edward Conze in his paper Buddhism and Gnosis presented to the Origins of gnosticism: colloquium of Messina, held 13–18 April 1966 - a seminal event in modern revision of scholarship on gnosis and gnosticism in Judaism and early Christianity. Conze noted that his starting point for Buddhism as the Mahayana Buddhism contemporary with the origins of Christianity. Conze noted that "This Buddhism I propose to compare with "Gnosis" rather than "the Gnostics," because the connotation of the latter term is still so uncertain that this Congress has been specially convened for the purpose of defining it." Conze's suggestion were supported and expanded by Elaine Pagels in The Gnostic Gospels (New York, 1979), and followed by appeals to Buddhist scholars to find evidence for contact between Buddhism and gnosticism. Pagels' suggestion however has not gained academic acceptance or generated significant further study. Although the book was a bestseller Donald Akenson (2001) concludes that the success of the book was due to it being a message the American popular audience was ready to hear. when he entered complete Nirvana"
The spread of Manichaeism (300– AD 500). Map reference: World History Atlas, Dorling Kindersly. Manichaeism spread with extraordinary rapidity throughout both the east and west. It reached Rome through the apostle Psattiq by AD 280, who was also in Egypt in 244 and 251. The faith was flourishing in the Fayum area of Egypt in 290. Manichaean monasteries existed in Rome in 312 during the time of the Christian Pope Miltiades. By 354, Hilary of Poitiers wrote that the Manichaean faith was a significant force in southern France. Also, in the Great Song of Mani (13th-14th century) Mani is many times referred to as Buddha Mani. Theories of a possible Asian influence on the Jesus movement usually focused on the Essenes. Even orthodox scholars like Dean Mansel argued that Buddhist monks and missionaries had provided the inspiration for the monks and ascetics whom we find recorded in the Middle East before the coming of Jesus, like the Essenes and the related Egyptian sect of the Therapeutae. Some writers explored the idea that Jesus himself might have drawn on these esoteric traditions, as suggested by the title of Arthur Lillie's 1887 book Buddhism in Christendom, or, Jesus, the Essene. In 1880, Ernst von Bunsen argued that Christian messianic concepts derived from a common fund of tradition that was shared by Buddhists and Essenes. The Essenes, it was thought, provided a crucial link between Eastern mysticism and Western heresy, with Jesus as the pivot between the two trends. If Jesus had access to Buddhist ideas, and the Gnostic sects themselves preached reincarnation and other Asian themes, then once again this was evidence that Jesus' earliest teachings were best preserved among the so-called heresies. Buddhism began in the 5th Century BCE in India. Thomas the Apostle traveled to India, roughly 500 years later, in the 1st century CE. According to tradition of the Christian church in India founded after his name, the Apostle reached Muziris, Tamilakam present day India in AD 52 and baptized several people, founding today today what is known as the Saint Thomas Christians. This would have been 19 years after Jesus' death. The manuscript of the Coptic text (CG II) of the Gospel of Thomas, found in 1945 at Nag Hammadi, Egypt, is dated at around 340 AD. It is the earliest found copy of the Gospel of Thomas. Assigning a date to the Gospel of Thomas is very complex because it is difficult to know precisely to what a date is being assigned. Scholars have proposed a date as early as 40 AD or as late as 140 AD, depending upon whether the Gospel of Thomas is identified with the original core of sayings, or with the author's published text, or with the Greek or Coptic texts, or with parallels in other literature. Some have suggested that of all of the Nag Hammadi texts, the Gospel of Thomas has the most similarities with Pure Land Buddhism. Edward Conze has suggested that Hindu or Buddhist tradition may well have influenced Gnosticism. He points out that Buddhists were in contact with the Thomas Christians. "But Terebinthus, his disciple in this wicked error, inherited his money and books and heresy, and came to Palestine, and becoming known and condemned in Judæa he resolved to pass into Persia: but lest he should be recognised there also by his name he changed it and called himself Buddas." — Cyril of Jerusalem, "Catechetical lecture 6"
In the 3rd century, the Syrian writer and Christian Gnostic theologian Bar Daisan described his exchanges with the religious missions of holy men from India (Greek: Σαρμαναίοι, Sramanas), passing through Syria on their way to Elagabalus or another Severan dynasty Roman Emperor. His accounts were quoted by Porphyry (De abstin., iv, 17)  and Stobaeus (Eccles., iii, 56, 141). 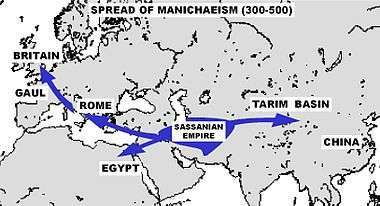 Finally, from the 3rd century to the 12th century, some Gnostic religions such as Manichaeism, which combined Christian, Hebrew and Buddhist influences (Mani, the founder of the religion, resided for some time in Kushan lands), spread throughout the Old World, to Gaul and Great Britain in the West, and to China in the East. Some leading Christian theologians such as Augustine of Hippo were Manichaeans before converting to orthodox Christianity. A number of scholars have stated that suggestions of an influence from Buddhism on Christianity is fanciful, without any historical basis and a form of Parallelomania. One tradition claims that Jesus traveled to India and Tibet during the "Lost years of Jesus" before the beginning of his public ministry. In 1887 a Russian war correspondent, Nicolas Notovitch, visited India and Tibet. He claimed that, at the lamasery or monastery of Hemis in Ladakh, he learned of the "Life of Saint Issa, Best of the Sons of Men." His story, with a translated text of the "Life of Saint Issa," was published in French in 1894 as La vie inconnue de Jesus Christ. The "Life of Saint Issa, Best of the Sons of Men" purportedly recounts the travels of one known in the East as Saint Issa, whom Notovitch identified as Jesus. After initially doubting Notovitch, a disciple of Sri Ramakrishna, Swami Abhedananda, journeyed to Tibet, investigated his claim, helped translate part of the document, and later championed his views. Notovitch's writings were immediately controversial. The German orientalist Max Müller corresponded with the Hemis monastery that Notovitch claimed to have visited and J. Archibald Douglas visited Hemis Monastery. Neither found any evidence that Notovich (much less Jesus) had even been there himself, so they rejected his claims. Once his story had been re-examined by historians, Notovitch confessed to having fabricated the evidence. Bart D. Ehrman states that "Today there is not a single recognized scholar on the planet who has any doubts about the matter. The entire story was invented by Notovitch, who earned a good deal of money and a substantial amount of notoriety for his hoax". A number of New Age or spiritualist authors have taken this information and have incorporated it into their own works. For example, in her book The Lost Years of Jesus: Documentary Evidence of Jesus' 17-Year Journey to the East, Elizabeth Clare Prophet asserts that Buddhist manuscripts provide evidence that Jesus traveled to India, Nepal, Ladakh and Tibet. ↑ Selected essays on gnosticism, dualism and mysteriosophy - Page 303 ed. Ugo Bianchi - 1978 "1 As for docetism in Buddhism, for example, see E. Conze, "Buddhism and Gnosis," in Le origini dello gnosticismo ("The Origins of Gnosticism"), Colloquium of Messina, 1966 (Leiden, 1967), pp. 657-58. ↑ In search of Jesus: insider and outsider images - Page 68 Clinton Bennett - 2001 "Pagels does not rule out Buddhist and Hindu influence on the Gnostic corpus. She cites the eminent Buddhologist Edward Conze (1904-79): 'Buddhists were in contact with Thomas Christians (that is, Christians who knew and used such .."
↑ Surpassing wonder: the invention of the Bible and the Talmuds Page 455 Donald H. Akenson - 2001 "That this particular product sold so well to Americans is an important piece of social history, one that tells a great deal about the cultural yearnings of the upper-middle class in that country in the 1970s and '80s." ↑ Jenkins, Philip. "How Gnostic Jesus Became the Christ of Scholars". ↑ Conze, Edward. Buddhism and Gnosis. ↑ Swami Abhedananda (1987). Journey into Kashmir and Tibet (the English translation of Kashmiri 0 Tibbate). Calcutta: Ramakrishna Vivekananda Math. ↑ Bradley Malkovsky, "Some Recent Developments in Hindu Understandings of Jesus" in the Journal of Hindu-Christian Studies (2010) Vol. 23, Article 5.:"Muller then wrote to the chief lama st Hemis and received the reply that no Westerner had visited there in the past fifteen years nor was the monastery in possession of any documents having to do with the story Notovitch had made public in his famous book" ... "J. Archibald Douglas took it upon himself to make the journey to the Hemis monistry to conduct a personal interview with the same head monk with whom Meuller had corresponded. What Douglas learned there completely concurred with what Mueller had learned: Notovitch had never been there." ↑ New Testament Apocrypha, Vol. 1: Gospels and Related Writings by Wilhelm Schneemelcher and R. Mcl. Wilson (Dec 1, 1990) ISBN 066422721X page 84 "a particular book by Nicolas Notovich (Di Lucke im Leben Jesus 1894) ... shortly after the publication of the book, the reports of travel experiences were already unmasked as lies. The fantasies about Jesus in India were also soon recognized as invention... down to today, nobody has had a glimpse of the manuscripts with the alleged narratives about Jesus"
↑ Indology, Indomania, and Orientalism by Douglas T. McGetchin (Jan 1, 2010) Fairleigh Dickinson University Press ISBN 083864208X page 133 "Faced with this cross-examination, Notovich confessed to fabricating his evidence." ↑ Ehrman, Bart D. (February 2011). "8. Forgeries, Lies, Deceptions, and the Writings of the New Testament. Modern Forgeries, Lies, and Deceptions". Forged: Writing in the Name of God – Why the Bible’s Authors Are Not Who We Think They Are (First Edition. EPub ed.). New York: HarperCollins e-books. pp. 282–283. ISBN 978-0-06-207863-6. Retrieved September 8, 2011. ↑ Prophet, Elizabeth Clare (1987). The Lost Years of Jesus: Documentary Evidence of Jesus' 17-Year Journey to the East. Livingston, MT: Summit University Press. p. 468. ISBN 0-916766-87-X.